Like most every enduring knife manufacturer, Camillus used several different tang stamps to mark its knives. These stamps are invaluable to collectors in determining information about the company’s tools including but not limited to their age. Below you will find examples & a bit of information about some of the more notable stamps used by Camillus to mark its knives. 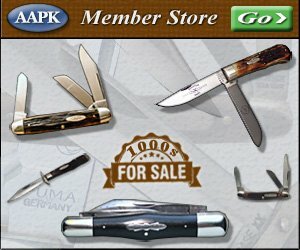 Make sure to stop by the AAPK store & shop for Camillus knives when your done here. The tang stamp shown here is known as Camillus’ three line arch stamp. It was used on Camillus knives in the early 1900s …estimate: circa 1902 to 1915. The tang stamp shown here is much like the widely known 4 line stamp shown lower on this page. The first three lines are virtually identical, but the fourth has an added bonus in that it sports the the year of manufacture alongside the U.S.A. This stamp has was used on Camillus knives for a very short time. The company quit referencing the date after 1915, but started back up in its later days preceding bankruptcy. The tang stamp shown here is known as Camillus’ three line straight stamp. I believe this stamp to have been used on knives manufactured from 1916 to the early 1930s. The tang stamp shown here is known as Camillus’ four line stamp. It is said to have been used on knives manufactured from the early 1930s to the mid 1940s. This tang stamp was used by Camillus from 1946 to 1950. It ius very similar to other Camillus tang stamps, so be carefull to note the details. Note the non-italic font & the length of line between “CAMILLUS” & “NEW YORK”. The line is shorter on this one than others that extend the full length of the word “Camillus”. You can view others with full length line below. This tang stamp was used by Camillus from 1960 to the late 1970s. You have to be careful with this one as it is very similar to a few others. Note that the letters non-italic & the underline extends the full length of the letters in the word “CAMILLUS”. Also, there are no dots between USA. This tang stamp was used by Camillus from the later 1970s into the 1980s. Like the stamp shown directly above this one, you have to be careful as it is very similar to a few others. Note that the letters are all in caps & italic. 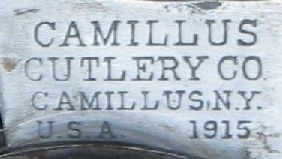 The underline extends the full length of the letters in the word “CAMILLUS”. Also, there are periods between the U, S, & A. This tang stamp was used by Camillus from 1989 up until its bankruptcy in 2007. Note that the Camillus brand emerged from bankruptcy in 2009, but this page will remain dedicated to the pre-bankruptcy knives.